Zidane rocks Real Madrid with resignation! Zinedine Zidane has announced that he will be stepping down as Real Madrid boss after two-and-a-half years in charge of the club. The Frenchman called an unexpected press conference on Thursday afternoon to confirm that he will be leaving his position as the first-team head coach, despite his continued success in the Champions League. Would Zidane have quit if Madrid had lost Champions League final? ‘I don’t know. Maybe,’ he said. ‘The most beautiful moment was when the president brought me to play for this great club,’ he said. ‘If there’s one as a coach, it was winning La Liga. For me that was the top. ‘This year the worst was losing the game against Leganes in the second leg of the Copa del Rey. I won’t use the word but you know it. ‘I’m not going to coach another team right now. I’m not looking for another team,’ he said. ‘I think the players need a change but I should thank them because at the end of the day it’s them that fight out there and this is a club of very high expectations,’ he said. ‘We always want more and more, I couldn’t ask for more from these players but now is the time for them to have a different voice in the changing room. ‘The squad already knows. I’ve not talked to them all individually but they all know, by message, yes. ‘I spoke with the captains and with Sergio Ramos. ‘As always as a person and captain, we have lived a lot together, he respects my decision. He wished me luck. ‘It can be a “see you later”. Madrid has given me everything. ‘I will be close to this club all my life. ‘But the decision, for many, doesn’t make sense. But it does to me. ‘It is the moment to make a change. ‘I think it is the right decision for everyone. ‘I have to thank the fans for all their support and love. ‘He told me that he was convinced he wanted to go. ‘I want to thank him for his commitment and passion to Real Madrid. ‘His behaviour has always been an example for all and representative of Real. ‘I don’t want this to be a goodbye but a “see you soon”. ‘After winning the Champions League, the decision was unexpected,’ he said. ‘It is a sad day for me, the fans and the players. ‘But he knows I wanted him as a player and as a manager. ‘I wanted him to stay forever and I wanted to convince him to stay. ‘But I know it was his final decision. 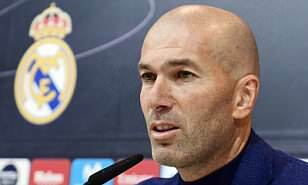 Zidane told club president Florentino Perez of his plans on Wednesday as he believes the team needs a change. ‘I love this club, I love the president,’ he said.